We started 2015 with average temperatures and precipitation that ranked near their normal values across the state. The infographic below includes some statewide headlines from the past month. Click any underlined heading in the graphic to read more about that topic, or scroll down to read our full climate summary. Up-and-down temperatures throughout the month averaged out to near-normal values. The preliminary statewide average temperature of 40.35°F ranks as the 56th-coolest January in 121 years of record. Most sites across the state finished January within a degree of their normal temperatures. Cloudy conditions dominated the first week of the month as highs mainly stayed in the 50s. Ahead of a cold frontal passage on January 4th, parts of the Coast hit the low to mid 70s. The following week, temperatures dropped as an upper-level trough moved over the eastern US and high pressure settled in over the Carolinas. A particularly cold day on January 8th saw lows in the teens and single digits and highs below freezing all across the state. The rest of the month saw more teeter-tottering temperatures. From the 18th through the 20th, highs climbed into the 60s, but they dropped back into the 40s and 50s to close out the month. A wet month for the coast averaged with drier-than-normal conditions across the rest of the state meant a statewide average precipitation of 3.75 inches, ranking as the 58th-wettest, or 63rd-driest, January on record. 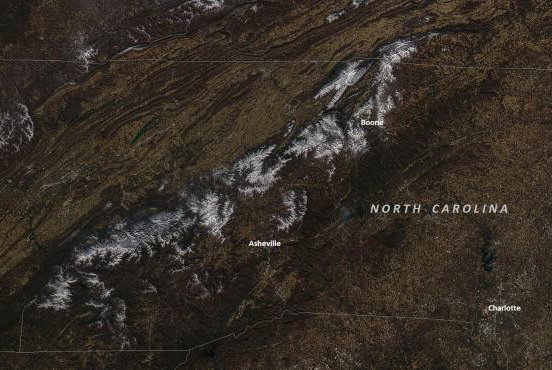 Mountain snowfall in late January was visible on satellite imagery. The most significant rain event came on January 12th, when a stationary front along the coast and a feed of Atlantic moisture brought day-long rain showers. Most sites east of Charlotte saw more than half an inch of rain with locally heavier amounts, including 3.95 inches at Goldsboro. That coastal rainfall helped alleviate Abnormally Dry conditions across that region, although the northwest Piedmont remains Abnormally Dry, along with part of the southern Mountains. We also had some minor frozen precipitation events in January. On the 9th, freezing rain fell across a few coastal counties, and on the 14th, the northern half of the state saw light freezing rain as well. Finally, on the 27th and 28th, the same storm system that became a blizzard for the Northeast US brought a dusting of snow to the higher elevations in the mountains and parts of the northern Piedmont and Coastal Plain. Back in November, our office and several other groups issued winter outlooks predicting a cool, wet winter with above-normal frozen precipitation. Two months into the winter, we've had near-normal temperatures and precipitation with no major wintry events. So what gives? One major hindrance has been the lack of snow-favorable large-scale weather patterns. When we issued our outlook last fall, the emergence of an El Niño pattern seemed imminent: Pacific sea surface temperatures had climbed above the half-degree threshold and most climate models predicted a weak El Niño event for the winter. Since then, those sea surface temperatures cooled to near-normal levels as shown in the animation on the left, making an El Niño event much less likely for the rest of the winter. That means we're also less likely to see an enhanced southern branch of the jet stream for sustained periods, which could limit the number of storms tracking to our south and off the coast. 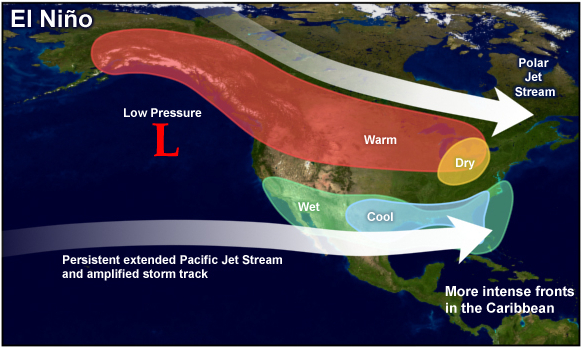 In our outlook, we also discussed several factors that shape the northern branch of the jet stream. One of those -- the Quasi-Biennial Oscillation, or QBO -- describes the strength and direction of winds in the upper atmosphere. In the fall, we noted that the QBO was strongly negative, indicative of upper-level easterlies. If those winds had migrated down to the jet stream level in the upper troposphere, it could've weakened the polar vortex and the polar jet stream, opening the door for more shots of cold air from the Arctic. Since winter began, the North Atlantic Oscillation (NAO) has remained mostly positive, meaning we've struggled to get favorable wintry patterns. However, the QBO has remained strongly negative so far this winter, which means those strong easterlies are staying put well above the troposphere for now. As such, two of our measures of the polar jet stream's strength and position -- the Arctic Oscillation (AO) and North Atlantic Oscillation (NAO) -- have remained positive for most of the winter, and we haven't seen regular cool conditions like we expected. For winter weather lovers, all hope may not be lost. Last winter, we also didn't have any help from ENSO or the AO and NAO, yet from late January through early March, we saw several wintry events. Of course, that's no guarantee we'll see the same this year, but it means we shouldn't write this winter off quite yet. Rapid Reaction: Winter Awakens with a Round of Frozen Precip.